Want to know the DMV road test pass rates in your city? Want to know the DMV pass rates in your city? The process of the DMV road test can be incredibly stressful and difficult. Even experienced drivers can have a tough time passing. In fact failing is common. 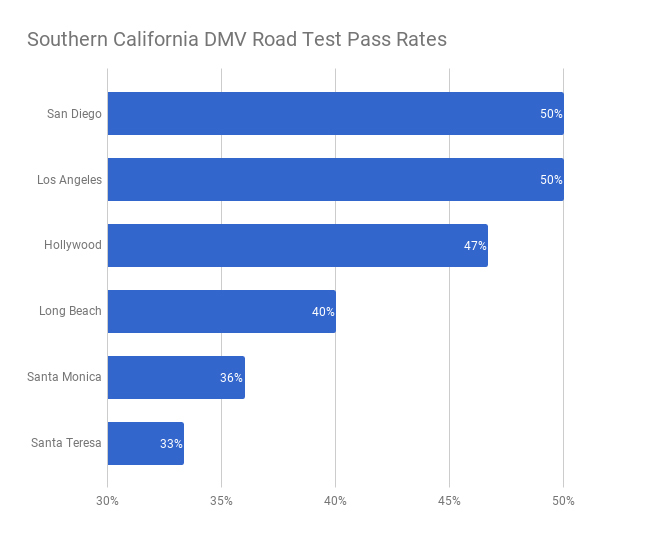 To help you better prepare for your DMV road test, we've compiled data on DMV road test pass rates across San Francisco, the Bay Area, and California. It's important for you to know ahead of time if the odds are with you or against you, depending on your DMV test location. Before we get into the data, we want to point out the obvious: The more time you have behind the wheel of a car in California, the higher likelihood you'll have of passing your test. Period. Practice, practice, practice. And learn the rules of the road as well. But we get that sometimes you just don't have enough time to keep practicing or work or life demands that you get a license asap. You might still be a safe driver, but need to just figure out how to pass the test. We've compiled a ton of resources to help you with this. Here are two good starting points we recommend: The Top 5 Most Common Road Test Mistakes and A Mock DMV Driving Test Video. 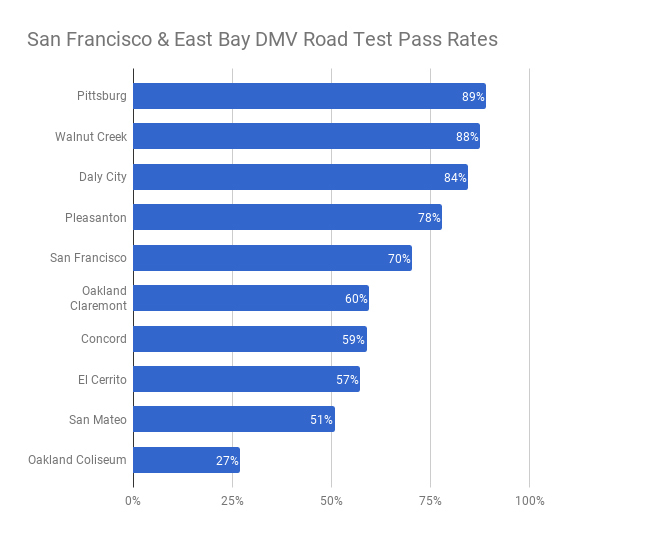 Above are the most popular DMV's in the San Francisco and East Bay areas for taking road tests, organized by pass rate. As you can see, some of the further east locations have the highest pass rates. San Francisco and Oakland Claremont, two of the most popular in our date, still have decently good odds of passing, all things being equal. And Oakland Coliseum? You should probably book somewhere else. 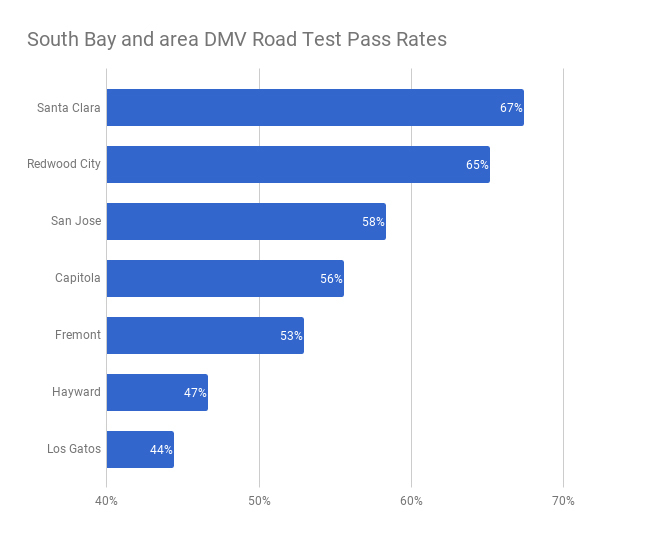 Santa Clara, Redwood City, and San Jose are also some of the most popular DMVs in the Bay Area to take your road test and their pass rates aren't bad. They line up with the overall pass overage of 58%. Hayward and Los Gatos skew toward more people failing, so you also might want to reconsider those locations if possible. Why are pass rates so different at California DMVs? Despite what you might thing, the DMV does not have pass quotas and examiners aren't out to get you. They just want you to be a safe driver. We all want you to be a safe driver. We've posted some of our data based on the thousands of road tests we've helped with directly to give you some insight into the process. If you're feeling overwhelmed, don't worry it's normal. Check out some of our resources on our blog or YouTube or consider checking out our car and driver service for road tests. Remember, we can book your DMV appointment directly. Finally, we're leaving with you with a few DMV pass rate trends. We'll be sharing more soon. It's interesting to see how certain DMV's pass rates can change over time. New test examiner?